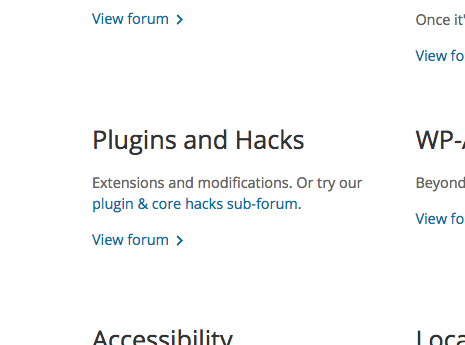 We (at the moment) have one sub-forum, ​Hacks under Plugins and Hacks. The new theme doesn't account for the possibility of subforums, so this is not discoverable without knowing the URL already. Ideally, we can do some gardening and actually remove the need for the subforums, but having support for it somehow would make sense to avoid needing to hack something in at a later date if it should ever become needed. If there is a subforum for a particular forum, could we add the link to it in the description of that forum on the homepage of the Support Forums? mapk's suggestion of including a link in the description is a good, easy, quick fix, but it doesn't really address the ramifications of having hierarchical forums in the first place. For one thing, such a link does not give us a description of what that sub-forum is for, and including a description in the parent forum's description would be confusing. On a basic level, the grid layout of forums does not lend itself to hierarchical forums at all simply because there isn't room, and making room would add a lot of whitespace to forums without sub-forums. To be consistent with a hierarchical structure, if there was to be a sub-forum link anywhere, it should occur below the main forum's link. This does not solve the lack of space problem for a description. That could be solved with a fly-out box triggered by the sub-forum link instead of going directly to the sub-forum. The fly-out would be a replica of a forum's grid content, except it would be for the sub-forum. The image below illustrates the concept. Forgive the graphics, that's not what I'm suggesting, consider only the concept. I see flaws with this concept as well, but I'm throwing it out there in hopes it'll trigger a better thought in someone. I actually support not having hierarchical forums at all, but as Clorith said, the ability to support hierarchy should be in place. We should avoid popovers like the one proposed, they're not very user friendly at all. Perhaps displaying child forums somehow before topics on page 1 of a forum list view is an idea, we could then get the descriptions in as well? Listing sub-forums on the forum list view is a tidy solution and a good idea regardless of what happens on the landing page. But that as the only place where sub-forums appear does not help new users who are trying to determine the best place to create their new topic. They'll have no idea sub-forums even exist. 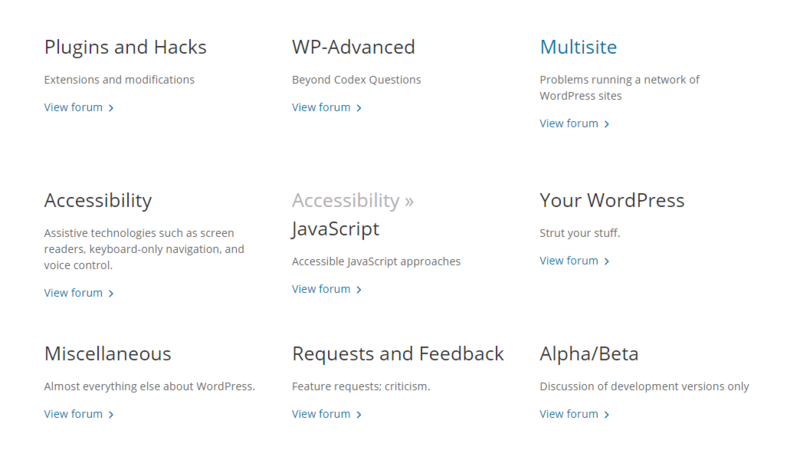 Somehow, all of what's available should be seen on the landing page IMO. netweb (and all who can't see the image), sorry about the flawed image link. I'll use a better image hosting service next time. I couldn't figure out how to get a .jpg link out of Google Photos. Your image was available by the way, for a short period of time (then it died for some reason :shrug:). Can we explore this further? Is there a necessity for subforums? Closing this out as wontfix, as after some time in the wild the theme seems to be working well as is, no need to add any unnecessary complexity.